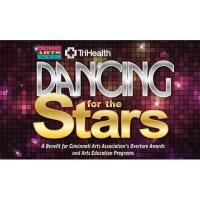 CINCINNATI, OH – Who will be voted Cincinnati’s best celebrity dancer? Which stars have the right moves to rule the dance floor? Find out on Saturday, April 13, 2019 when the Cincinnati Arts Association (CAA) celebrates season thirteen of its annual fundraiser Dancing for the Stars at the Music Hall Ballroom to benefit CAA’s Overture Awards – the nation’s largest locally-run high school arts scholarship competition – and Arts Education Programs. Inspired by the hit ABC-TV show Dancing with the Stars, Dancing for the Stars will feature seven Cincinnati celebrities paired with some of the area’s finest professional dancers in a competition program, at which the audience will vote for their favorite celebrity dancer. The competitive dance for the evening will be the cha cha and each dance pair will have ninety seconds to woo the crowd and the judges. In addition to the winner of the dance competition, Dancing for the Stars will crown a Fundraising Champion – the celebrity dancer who raises the most revenue toward the event’s fundraising goal through table/ticket sales and donations. Fans may add a donation under their favorite celebrity’s name at the time of ticket purchase, or simply make a donation if they cannot attend the event. These direct donations (outside of the event ticket price) will help one of the fans’ favorite celebrities win the Dancing for the Stars Fundraising Champion award – which will be announced the evening of the event – and are 100% tax deductible. EVENT COMMITTEE: Amal Daoud, Terry Foster, Sue Gilkey, Jim Howland, Ginger Loftin, Rosemary Schlachter, Phil Schworer, and Tracey Skale. EVENT SPONSORS: TriHealth – Presenting Sponsor, Arthur Murray – Cincinnati, Doreen Beatrice, Bonita Brockert, Brandon Etheridge, Graphic Village, Pebble Creek Group, Jozsef Parragh, Phoenix Rising Ballroom, Josh Tilford. CAA's Education Department promotes life-long learning through its programs, which are diverse, multidisciplinary, and accessible to all ages and cultural groups. SchoolTime presents a series of programs that feature nationally-recognized artists at CAA's two venues (the Aronoff Center and Music Hall), and Artists On Tour brings the finest local artists in the region to Tri-state schools for interactive arts experiences aligned with the curriculum. The Overture Awards Scholarship Competition is the largest locally-run arts scholarship competition in the country. The program annually provides a $4,000 scholarship to six area high school students for education and training, with 18 finalists each winning a $1,000 scholarship. Each year, nearly 500 students are nominated by their schools to compete in one of six artistic disciplines: Creative Writing, Dance, Instrumental Music, Theater, Visual Art, or Vocal Music. There are three levels of competition: Regional, Semi-Finals, and Final. The Overture Awards was developed to recognize, encourage, and reward excellence in the arts among Tri-state students in grades 9-12. It also provides students an opportunity to share their talents and interests among their peers in a supportive environment outside of their individual schools. Now in its 22nd year, The Overture Awards was launched in 1996 by the Cinergy Foundation and Leadership Cincinnati (a Greater Cincinnati Chamber of Commerce program). Founded in 1992, the Cincinnati Arts Association (CAA) is a not-for-profit organization that oversees the programming and management of two of the Tri-state’s finest performing arts venues – the Aronoff Center for the Arts and Music Hall – and is dedicated to supporting performing and visual arts. Each year, CAA presents a diverse schedule of events; serves more than 600,000 people in its venues; features the work of talented local, regional, and national artists in the Weston Art Gallery (located in the Aronoff Center); and supports the work of more than one dozen resident companies, including Cincinnati Ballet, Cincinnati Opera, Cincinnati Symphony/Pops Orchestras, May Festival, and Fifth Third Bank Broadway in Cincinnati, presented by TriHealth. Since the inception of its acclaimed arts education programs in 1995, CAA has reached nearly 1.6 million students.